I just love wild rice. It’s very similar to brown rice, but with a deeper, richer flavor, and an even heartier texture. Did you know that it’s not actually a true rice? Yes, it grows in paddies like rice, and shares many nearly-identical culinary characteristics, but it’s technically a marsh grass. In fact, until the mid-1960’s, most wild rice in this country was grown in natural streams and lakes, and still cultivated mainly by hand. Because of this lack of commercial development (due to the unique properties of the plant), wild rice still remains quite expensive, compared to other true rice. Wild rice is most often sold in packages mixed with long-grain white rice, to make it more affordable, and to mitigate the coarse texture of the thicker hull. I’ve seen varieties of mixes that included brown rice, fragrant basmati rice, and even a muti-grain mixture from Trader Joe’s that included black barley and daikon radish seeds (which is absolutely delicious!). You can find 100% wild rice online, but I’m more of an brick-and-mortar girl; I want to see what I’m buying. Though I have not specifically checked the bulk bins at Whole Foods, I suspect they’d be the best bet. I don’t know what it is about the standard pancake base (whether or not it has sugar added to it) that makes it demand a sweet topping. Maybe it’s just a Pavlovian reaction, but it just seems like a natural requirement to me. These pancakes were pretty good served with a nice maple syrup, but they were heavenly when paired with a friend’s homemade blueberry preserves. Wild rice and blueberries have a natural affinity for one another, as well as for another delicacy: duck. 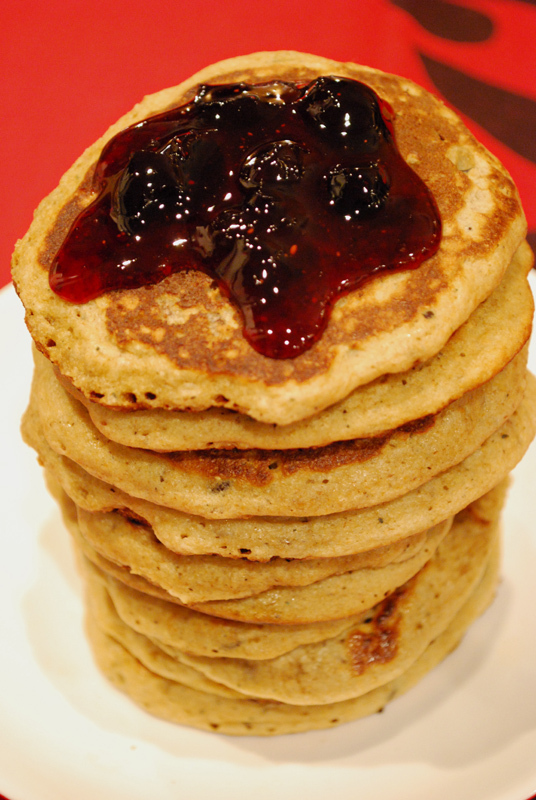 I’m dying to serve a sliced seared duck breast, all crisp-skinned and rosy-red inside, atop one of these pancakes, with a blueberry gastrique drizzled over the whole thing. My mouth is watering! 1. In a large bowl, mash the wild rice with a potato masher or fork for a minute or two, just enough to make it a little sticky. Add the milk, buttermilk, yogurt, and eggs, and whisk until combined. 2. In a separate bowl, whisk together the flour, baking soda, salt, pepper, and thyme. Stir the dry ingredients into the rice mixture, until just combined. Preheat the oven to 200º F, and leave a sheet pan on one rack. 3. Heat a nonstick pan or griddle over medium heat until hot but not smoking. Brush or drizzle the surface with melted butter or oil. Working in batches, scoop the batter onto the hot griddle or pan in 1/4 cup measures. Cook for 2 to 3 minutes on each side, or until golden brown on the bottom. Transfer the pancakes to the sheet pan in the oven to keep warm until ready to serve. 1. Depending on your ingredients, your batter may be a little thicker or a little runnier. If you need to thin the batter, add a little more milk. If it’s too runny, add a little more flour. 2. I used the specialty white-whole-wheat flour here, which I thought lent a nice, nutty, whole-grain flavor to complement the wild rice, but retained some of the nicer texture of a standard white flour. Feel free to use whatever sort of flour you like; regular whole-wheat will make for a very hearty pancake, whereas regular all-purpose will make a softer end product. An even combination of the two would be a nice compromise. 3. These could conceivably be made into a gluten-free version, as wild rice produces no gluten. I’m not experienced in converting recipes thusly, but I imagine you’d simply have to replace the wheat flour with a gluten-free flour, such as buckwheat, potato, corn, or even almond.